As the world’s first cross-chain lending platform for cryptocurrency, Lendingblock will be helping to provide instant matches for lenders and borrowers – in a transparent way. Lenders can lend any digital asset, in the same way that borrowers can borrow any digital asset. It is not simply open to individuals – institutions can also participate, and earn money on long-term investments. The ecosystem is completely self-contained, and features an exchange where borrowers and lenders are linked, in addition to providing smart contracts which covers the exchange, interest payments, collateral management, default processing and repayment. Lendingblock believes that the desire for borrowing and lending cryptocurrencies will allow their market to generate hundreds of millions of dollars of revenue within three years. The company also believes in a positive future for digital assets, but that there needs to be stronger supportive services in place to help facilitate this. Which is exactly where they come in. What is the most exciting aspect of Lendingblock? “The size of the crypto market has grown faster than it has matured. Basic financial services that are taken for granted in existing assets are the weakest link at the moment, and 2018 will be the year that trustworthy regulated infrastructure catches up and enables broader institutional access to the crypto economy,” he says. “Our USP is that we are building the first crypto to crypto exchange for securitised loans, with a strong focus on meeting needs of institutional and professional users. This will give security to the lender while offering a fast, transparent service to borrowers and lenders alike without the need to wait for credit checks or loan approvals. “We are working to be a transparent and regulated service, as we believe this is critical in earning the trust of investors and users,” he adds. 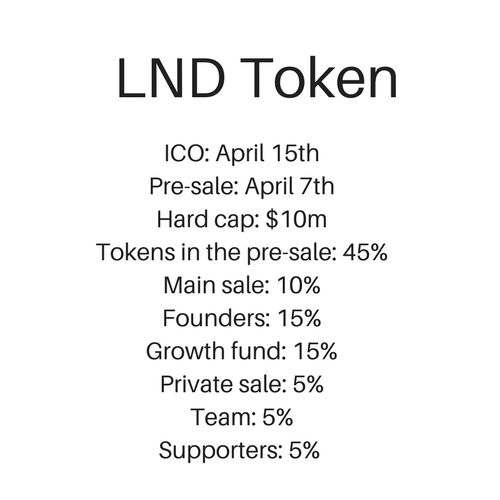 “The LND token will be used solely for paying interest on loans. As the use of the platform grows, the amount of interest borrowers need to pay will result in increased demand for LND,” says Swain. Who is behind the ICO? Co-Founder and CEO Steve Swain boasts a background from global banks such as Lehman, Credit Suisse, Macquarie and UBS, followed by being a big-4 technology consulting partner. He is joined by Co-founder and COO Linda Wang, who is a serial entrepreneur and product designer with extensive blockchain experience, dating back to 2014. The rest of the team includes Chief Technology Officer Luca Sbardella, Product Manager Bryan Du, US Business Development Damien Williams and Full Stack Ethereum Engineer Julien Klepatch, to name a few. With the strong backgrounds of the founders, and the skillful team and advisors, we rate Lendingblock as a Solid ICO.